.... they shall be mine, says the LORD of hosts, in that day when I make up my jewels; ... - Malachi 3:16-17. This world is not my home; I'm just a-passin' through. Let us be glad and rejoice and give Him glory, for the marriage of the Lamb has come, and His wife has made herself ready - Revelation 19:7. Birth pangs – Jesus warned, “... these are the beginning of sorrows (Greek [Strong 5604] ?d?? (odin) = the pain of childbirth; intolerable anguish)” - Matthew 24:8. Apostasy of Faith – Jesus questioned, “ ... when the Son of man comes, shall he find faith on the earth? - Luke 18:8, cf. 2 Thessalonians 2:3. ... as it was in the days of Noah, so shall it be also in the days of the Son of man. They did eat, they drank, they married wives, they were given in marriage, until the day that Noah entered into the ark, and the flood came, and destroyed them all. Likewise also as it was in the days of Lot; they did eat, they drank, they bought, they sold, they planted, they built; But the same day that Lot went out of Sodom it rained fire and brimstone from heaven, and destroyed them all. Even thus shall it be in the day when the Son of man is revealed - Luke 17 26-29. The “end-time” spiritual instinct (what A. W. Tozer would have referred to as “the magnetic draw”) is not present in the unbeliever or carnal Christian and they also reject the empirical evidence that is so clear to the Bible-believing Christian. .... scoffers will come in the last days, walking according to their own lusts, and saying, "Where is the promise of His coming? For since the fathers fell asleep, all things continue as they were from the beginning of creation." For this they wilfully forget: that by the word of God the heavens were of old, and the earth standing out of water and in the water, by which the world that then existed perished, being flooded with water. But the heavens and the earth which are now preserved by the same word, are reserved for fire until the day of judgment and perdition of ungodly men – 2 Peter 3:3-7 (NKJV). none of the wicked shall understand, but the wise shall understand - Daniel 12:10. ... but the people who know their God shall be strong, and do exploits (take action) - Daniel 11:32. And have no fellowship with the unfruitful works of darkness, but rather expose them - Ephesians 5:11. And everyone who has this hope in Him purifies himself, just as He is pure - 1 John 3:3. Back in the mid 1990's I did a series of talks to a small group in Hamilton, New Zealand, entitled The Bride of Christ. This developed out of a series of articles which I wrote for the late Barry Smith's paper, Omega Times. Barry was warned by AoG pastors in Australia that if he continued to publish my writings his platform opportunities would be affected. Barry and I agreed that he had enough battles of his own without fighting mine, so the series was wound up. That event sparked the formation of CWM and the launching of CETF. The series of audio tapes on The Bride of Christ went worldwide, as did CETF, and the rest, as they say, is history. One of the tapes in the series is entitled, It's Clean-Up Time in the Church, which in a small way proved to be prophetic. Encouraged by our literature several decided to make a stand, including Peter Fowler (PF) who brought a serious charge against AoG's front running preacher and pastor, Frank Houston (FH). Frank was disciplined by AoG who forbad his preaching in Australia and New Zealand for life. FH is now dead and PF, with whom I had an extensive email correspondence, has disappeared after achieving an undisclosed settlement with AoG-NZ. Peter Fowler told me that he would be pleased to be put in touch with any person who had suffered abuse similar to his own. If anyone can contact PF I would appreciate their asking him to get in touch with me – see back page of CETF or email philip@christian-witness.org. The true Bride of Christ will not avoid or ignore the truth, nor will they shy away from true repentance, which requires total disclosure. It's Cleanup Time in the Church. The Bride of Christ must make herself ready to meet her Bridegroom. Words: William O. Cushing, 1856. Music: Jewels, George F. Root, 1866 (MIDI, score). 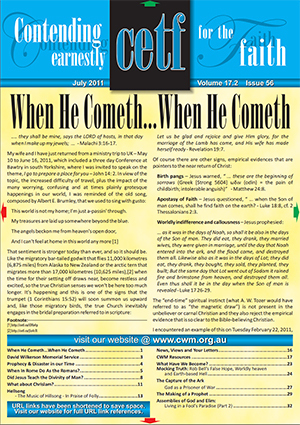 Once more we commend the articles in this issue of CETF to your prayerful consideration and ask you to sincerely and earnestly pray for the forthcoming CWM Conferences in New Zealand and Australia on the theme of The Vanishing Gospel and the Call of God to Preach The True Gospel. This is undoubtedly the most important issue facing the church in our time – see separate promotional literature enclosed.